Walid Siti, The Black Tower, 2016. Plastic figurines, paper, acrylic, plaster, twigs, 35 x 50 x 35 cm. © Courtesy of the artist and Zilberman Gallery. Zilberman Gallery – Berlin is pleased to announce Walid Siti‘s first solo exhibition in Germany, The Black Tower, curated by Nat Muller. The exhibiton premieres new works by London-based Iraqi-Kurdish artist Walid Siti, including works that are site-specific to the gallery space on Goethestrasse. Walid Siti‘s oeuvre draws heavily on his lived experience of exile and loss, yet at first glance that is not apparent from his abstract landscapes and geometric and architectural structures. His work is characterised by a subtle, almost understated, poetics and politics of form. It is the sub-text of repression and conflict—tempered with the human capacity for resilience in the face of adversity—that continues to drive his practice. The Black Tower is a sombre statement in sobering times. Nevertheless, Siti still offers us a ladder, a staircase, a thing of beauty and of the imagination, for a way out that looks increasingly slim. The tension between ruin and hope directs the tone of The Black Tower. At play here are two oppositional forces. On the one hand darkness, confinement and destruction, which come to the fore in Walid Siti‘s wounded sculptural objects, such as for example the sculptural piece The Black Tower (2016) after which this exhibition is named. 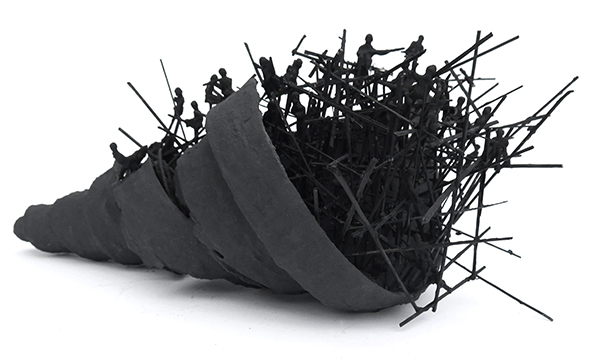 These objects, smothered in heavy black paint combine architectural and other kinds of wreckage with the iconography of war and repression: toy plastic soldiers, barbed wire, and scorched earth. Together they highlight the machinery of armed conflict and the expendability of human life. On the other hand, there is always Siti’s longing for betterment, which is manifested in the returning visual trope of ladders, mountains, ziggurats and staircases. Installations such as Joined Ladder (2016), a white floor-to-ceiling open-ended ladder consisting of smaller ladders, and Passage (2016), a pigment print showing a close-up of a photograph the artist had taken of a cliff in Kurdistan emphasise movement, escape and possibility. Walid Siti‘s art is ultimately one of construction, no matter how uncertain the times. To underline this, 15 of Siti’s working sketches of realised installations, and some that are still to be realised, are included in the exhibition. These sketches shed light on his artistic thinking process and unpack the grammar of Siti’s visual language. Walid Siti (1954, Dohuk) was present at the Venice Biennale three times, first in 2009 together with other Kurdish artists in the exhibition Planet K (Kurdistan), participating in the Iraqi Pavilion at the 54th Venice Biennale in 2011, and the Iranian Pavilion at the 56th Venice Biennale in 2015. His works can be found in numerous collections, The British Museum, The Imperial War Museum, Victoria & Albert Museum in London, The National Gallery in Amman, Barjeel Art Foundation in Sharjah, The World Bank and The Iraq Memory Foundation, both in Washington DC. The Black Tower is accompanied by a catalogue edited by Nat Muller, with a preface by Lotte Laub and texts by Nat Muller, Nada Shabout and Rijin Sahakian. A conversation between Walid Siti and Nat Muller will be held at the gallery. Date to be announced. For more information or visuals, please contact lotte [​at​] zilbermangallery.com.